Earlier this month I went to the Social Cafe At Hauz Khas Village. Yes, I was in part compelled to visit the place because of the extended feature it got in Imtiaz Ali's Tamasha. But also, because I had gone (for the first time) To the Hauz Khas Village and didn't want to go a place where I had already been to, in other parts of the city. A little about the Hauz Khas Village first. Don't go to that place unless you want to witness a barrage of crowd and stacked up shops in all sorts of dimensions, constructed in what is basically an ordinary market which would have felt slightly better had the lake near it not been so polluted or its nearby monument had not been over crowded with crazy teenagers taking potentially life threatening “selfies”. So, that's the summary for HKV, it's an over-rated market with branches of most of the hyped up restaurants, cafes and shops of the city being accessible in a small radius of 1-2km. Back to Social then. Social falls under the category of “Themed Cafes”. Social goes a step further though, it themes each cafe differently. The one in Hauz Khas Village branch has a 'rural' theme. So, you'll see a lot of incandescent bulbs around the place, concrete textured walls, taps that you'd generally see in a rural setting. Social is excessively themed. Themed to a fault! Actually. For examples, the tables are sort of intentionally under-polished. And this is a problem. While I was there, a splinter from the under polished table caught my sweater and ruined the wool winding slightly. Thankfully, it wasn't a severe damage to my sweater but beware when you are there. Also, something that I noted was that Social is a heavily successful place. So, on a Saturday afternoon the place was so crowded that it affected the service. One of the managers told us that we couldn't just walk in and sit on any empty table we felt like and that we'd have to wait outside until the place gets emptier. That's the rudest thing I've heard at a cafe. It's understandable to a degree but it was also heavily discomforting. But we did get a slightly better spot in place of that, so not many harsh feelings there. Like I said before, social is themed to a fault and the faults are exemplified when you begin with the process of ordering the food. The menu, is horribly designed. It's designed as a newspaper But unlike one, it's mostly a single column layout. It's practically impossible to read it effectively. The composition is such, that it makes it hard to figure out some of the essentials, like whether the dish is vegetarian or not or whether the beverage is alcoholic or not or simply, what is the composition of the dish. You just get a fancy name and a vague explanation Of the composition. It's hard to order properly from this menu. After I did get past the utterly confusing menu, I did have something to eat, which were basically Jalapeño and Cheese Nuggets with a fancier name along with a platter of something that contained a bunch of dips, pita bread and a cheese patty shaped as a samosa. Again, I was unsure of what I was having because of the terrible menu composition And whatever I had didn't seem to adhere to any proper cuisine, and felt more like a chef's experiment. The taste of it was fine, but it wasn't great but it wasn't uneatable either. Poor design decisions prevailed over here as well. Having the jalapeño nuggets was a nightmare. They came stacked in a small bucket, and there was hardly any place to in there to take out the nugget comfortably. The platter was a slightly better experience though. Served in a conventional plate It was much simpler to eat. The beverages were a completely different story though. They tasted great and although they too were served in a crazy unnecessarily different way, they weren't bad. I had a great Iced Tea, which got served to me in what looked like a miniature bath tub. Overall, while I was walking out of the place, I did have the feeling of experiencing something different And somewhat cool but also that, that this isn't the place for me. Hauz Khas Social isn't actually a bad cafe. It's that kind of a place where teens would take their friends to impress them with Cool gimmicks, I'm not sure if those guys Care about the quality of food (You can probably guess, I was never a part of that group) or just the kind of place where Imtiaz Ali would provide a setting to a great AR Rahman song (Listen: Tum Saath Ho). Social is just not the place where you would spend a quite afternoon, enjoying your food in solace. Bejoy Nambiar's Wazir has been a much hyped release, with the trailers coming out more than an year before the release. In fact the project itself has been in development longer than 10 years, and to be honest, Wazir does bring with it some new and interesting ideas but is far from perfect. But first, What exactly is a 'Wazir'? I've been asked this question several times, in fact, in the theatre I found people looking up the chess term, when it first pops up. Wazir is actually 'fairy chess piece' found in certain variants of chess. It's a combination of a rook and pawn. It's an upgrade to the pawn but a downgraded rook. it's function is much like the rook but it can only move one step at a time. There's a lot to like about the movie. To begin with the central idea of the movie is extremely powerful and very interestingly put forward. Wazir is one of those movies that are worth a watch for the idea alone. But apart from the idea, we also have some amazing acting at play here. The chief actors, Amitabh Bachchan (who gets the movie's most of the one liners, the one about learning to learn being particularly striking), Farhan Akhtar and Manav Kaul (of Kai Po Che fame) Are flawless They make the movie extremely enjoyable, even when the screenplay slips. Shantanu Moitra's soundtrack is top notch. The title song 'Tere Bin' and a chilling 'Tere Liye' are the highlights, the music holds the screenplay very well and is very intelligently used by Bejoy Nambiar, producing the right effects at the right time. Nambiar also executes the action sequences with much aplomb. Making it an engaging watch throughout and at 1 hours 40 minutes it's a tightly woven thriller. But where Wazir falls short is the poor sketching of its central character. The Character portrayed (excellently played by Farhan Akhtar), is extremely irresponsible and For a movie based on the much nuanced game of chess, it's ironic that the he's prone to making some very rash decisions. And this is Wazir's biggest problem. To keep things consistent with the character, the script takes turns which could have been executed better if the Farhan Akhtar's character had been better written ultimately leading to an underwhelming climax. I get where some of this is coming from, ultimately everything adheres to the central idea But perhaps the movie needed a lot more time than the screenplay gives it, to build a much more nuanced character than what we get. As I mentioned previously, the idea of Wazir has been in development for over 10 years. It's a variation of Vidhu Vinod Chopra's original project “The Fifth Move”. Chopra's Fifth Move was ultimately shelved even as Robin Williams and Anthony Hopkins were reported to have been signed for the movie. Chopra didn't want to make an Indian version at the time because he felt that the Indian Audience wouldn't want to watch such a movie. . 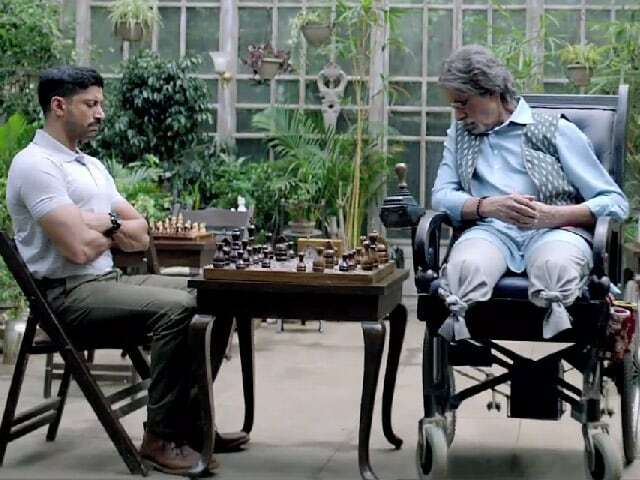 It was about two men playing a game of chess, in which one player is dead and the another, alive and even though this setting is extremely different from wazir offers, I feel that the central idea was stil the same. Wazir feels like a toned down version of the same concept. It also tries to add an element of suspense to the movie, and while it is indeed a captivating reveal (Again, credit to Nambiar for an excellent execution!) but doesn't succeed entirely, much of it was easy And somewhat obvious. Again something you don't want to happen in a movie based on chess of all things. Overall, Wazir is a constantly engaging and enjoyable watch, with an uplifting soundtrack, brilliant direction and flawless acting but a poorly sketched out central character bogs the script down and what could ultimately have been a very special movie is reduced to a terrific execution of a flawed screenplay. Perhaps, Chopra should have used the fifth move as it is, and we'd have got a far better movie.